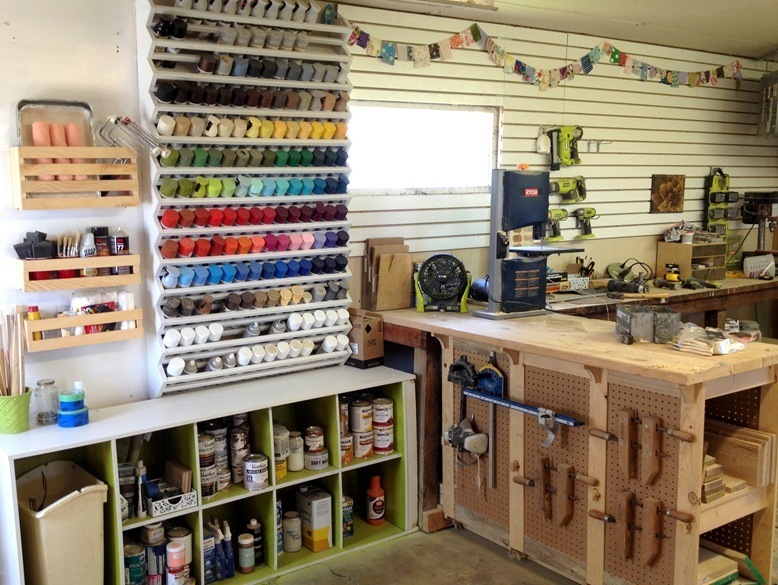 I’ve rounded up some of the best DIY garage organization ideas for you! 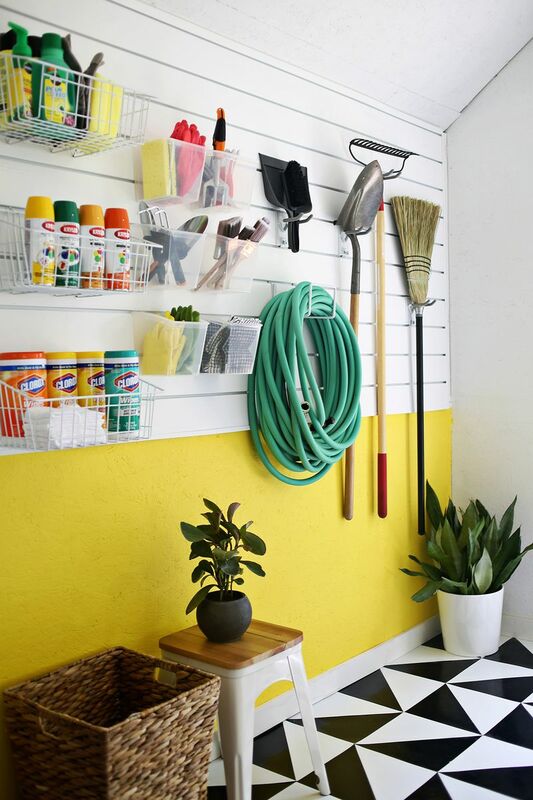 If you’re lucky enough to have a garage, treat yourself to some organization tips that go beyond the pegboard. 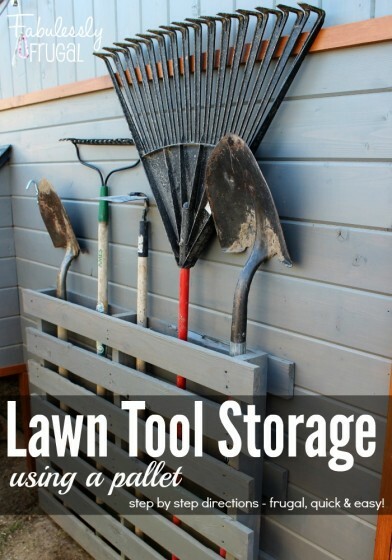 These tips are useful for real families who need help organizing those 20 garden tools, 5 bicycles, 10 basketballs, and 15 fishing rods that might currently be scattered all over the garage floor. 🙂 To learn more about each idea, click on the blue links. Happy organizing! 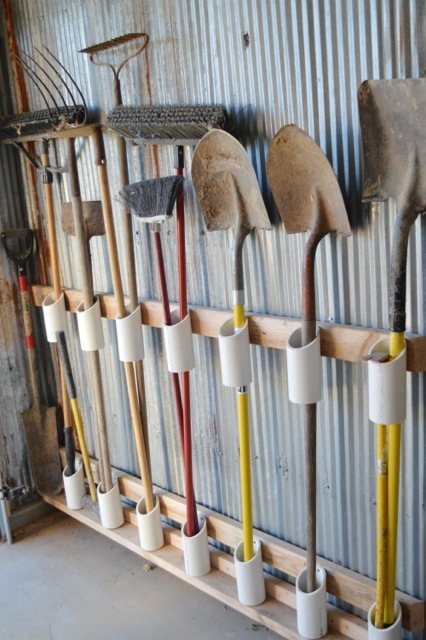 Newly Woodwards used cut PVC pipe attached to boards to create this impressive tool storage system. Be still my Type A heart! This shelving system by A Bowl Full of Lemons is spectacular. Go see how she installed it and where all the supplies were purchased here. 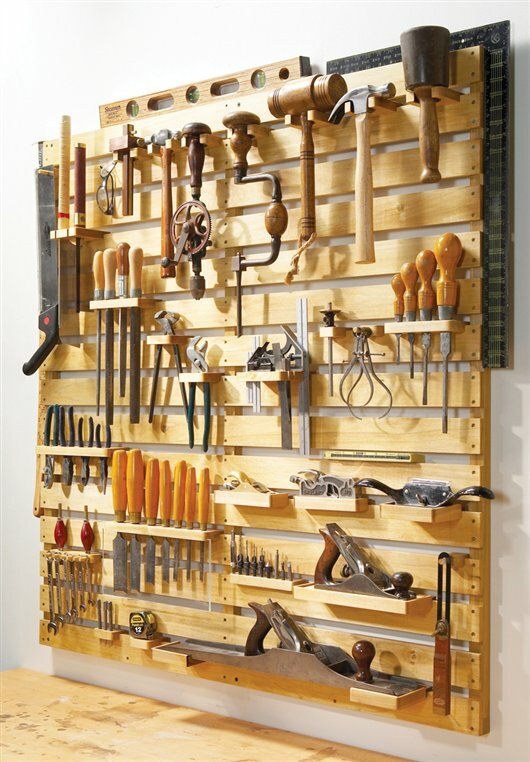 This DIY tool rack by Popular Woodworking keeps tools off the table and in plain view for easy access. Check out the building plans here. I promised organization for real families, and this is absolutely doable for any family with the means to get a pallet home! 🙂 Pallets can often be found for FREE or purchased from hardware stores. When painted and secured to the wall, a pallet becomes a brilliant and affordable garden-tool storage system. 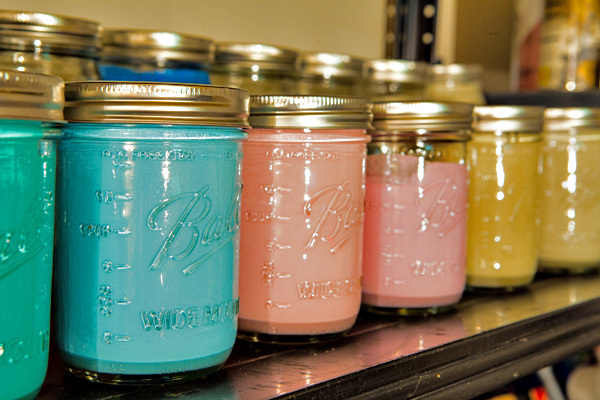 Cut down on paint can clutter and preserve leftover paint by storing leftovers in glass jars. I like to label the tops of jars with the paint color and where I used the paint. Vertical storage is a fantastic way to get bulky items out of the way! 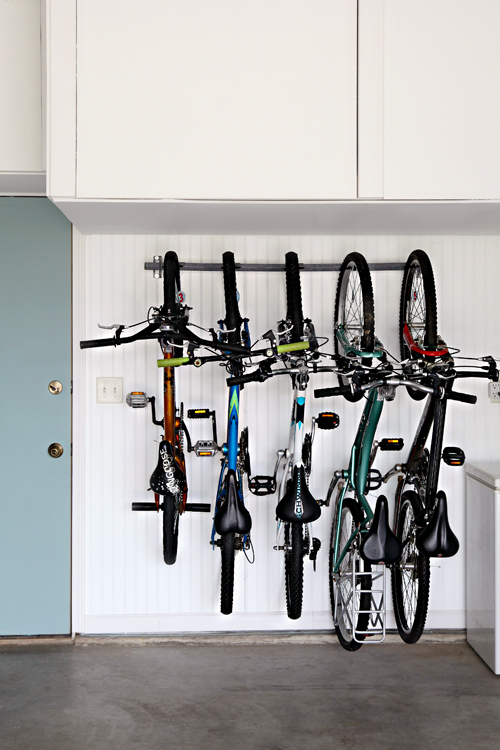 This wall bike rack is a great idea if your kids are strong and able to store their own bikes. 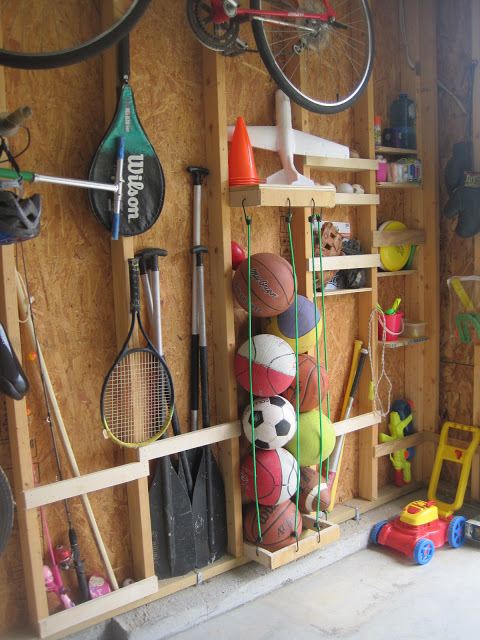 If your garage is unfinished, make use of those exposed studs! This is organization at the simplest form, and is low budget and EASY to accomplish! 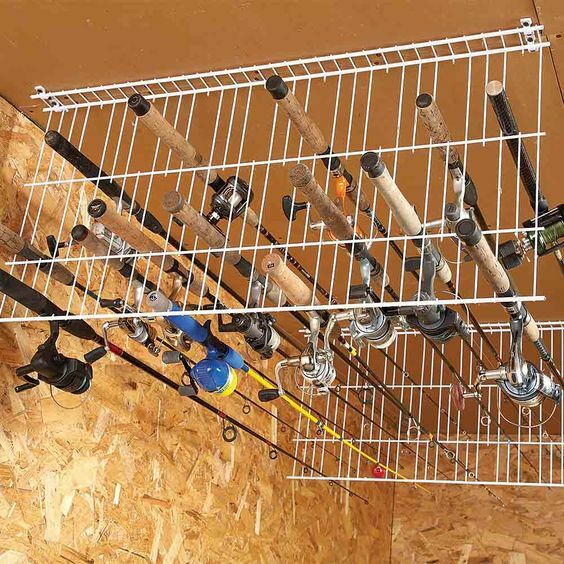 When hung from the ceiling, wire racks become an inexpensive and effective way to store fishing poles. 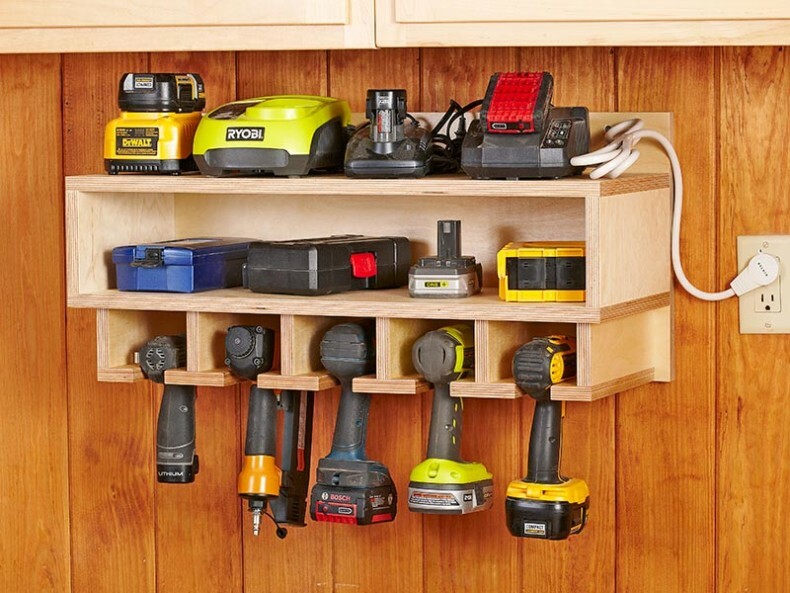 Create a DIY cordless tool station for your power tools. I love that they placed the shelf beside an outlet so everything is neat and contained. Featured here. 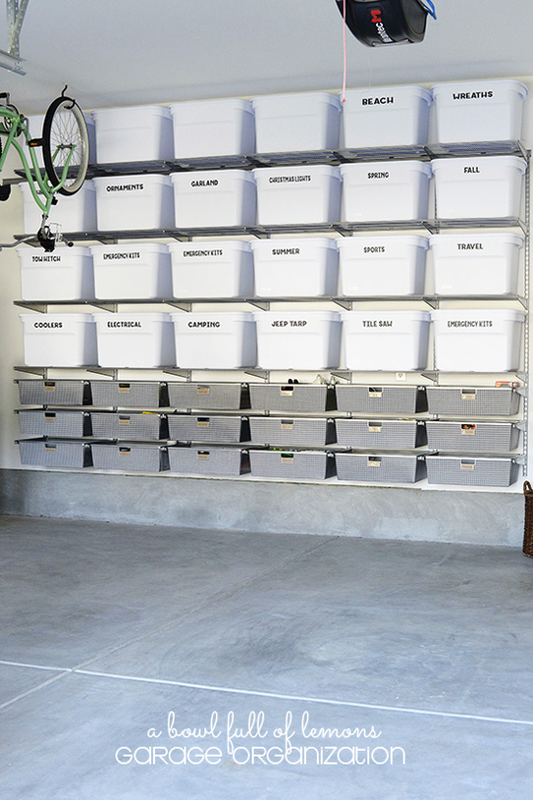 Learn how to build your own custom garage storage! Detailed plans for this easy build can be found over on Ana White. 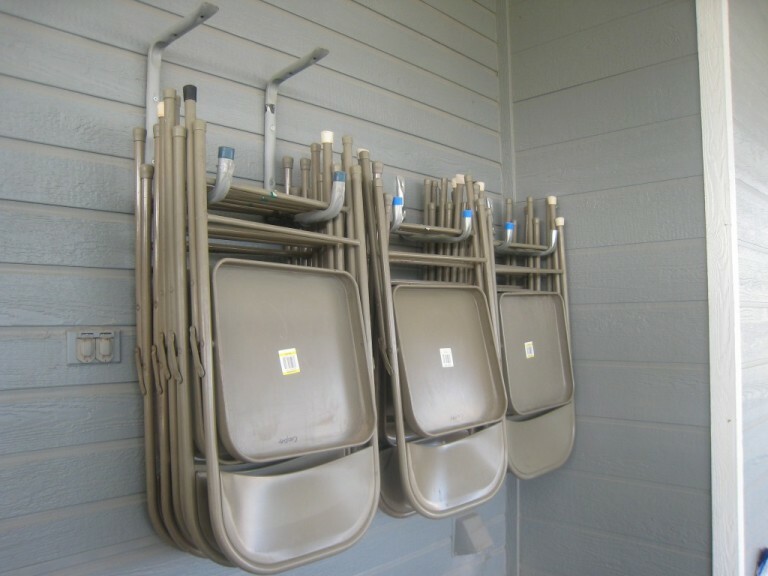 Folding chairs can become a real mess when not stored properly. Attach large hooks to the wall and store chairs upside down to keep them tidy. 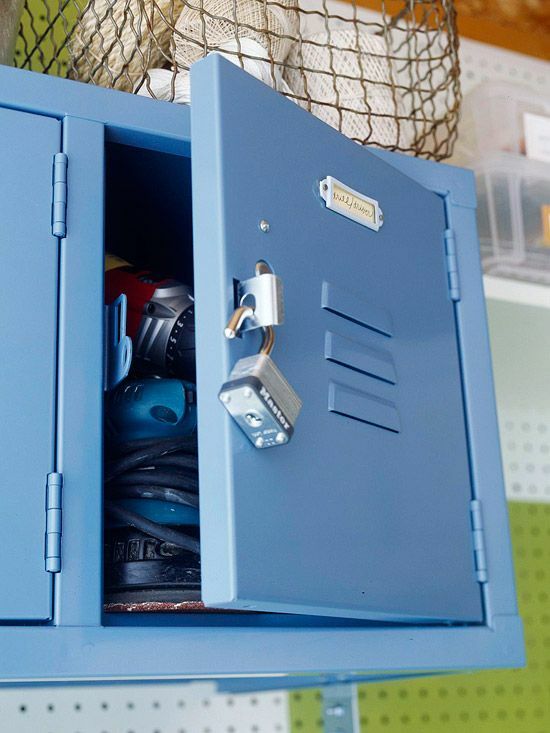 If you leave your garage door open frequently or have a garage that doesn’t have a door, a locker would be a great investment for your family. This is also a great way to keep chemicals and potential dangers away from pets and small children. 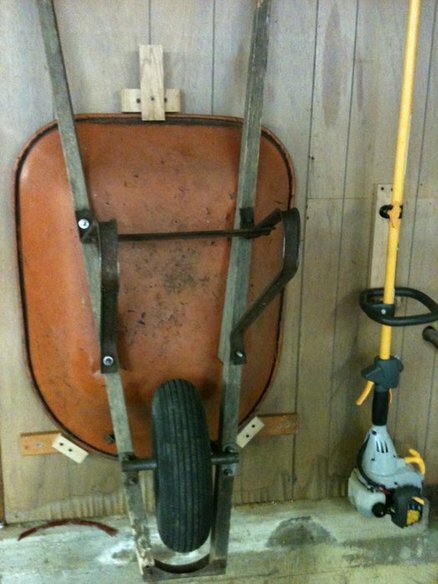 With just a few blocks of wood attached to the wall, you can create a vertical storage system for your wheelbarrow! This is a great idea. 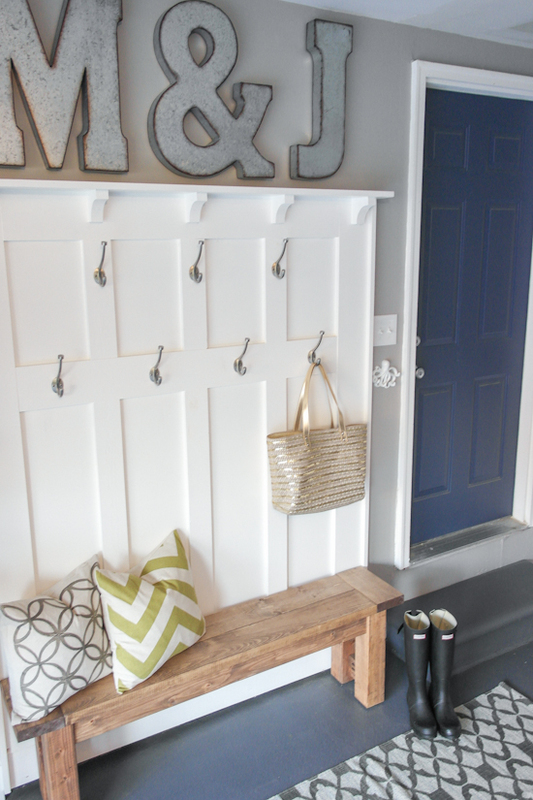 No room for a mudroom inside your home? Create one in the garage. This is a great example of making your space work for YOU! Thanks for sharing these tips. We just purchased a new home, the house is big, but storage space is limited. I like the idea of hanging the folding chairs, they are always in the way. I also really like the PVC holders for yard tools. Thanks for stopping by Lori and congrats on your new home!